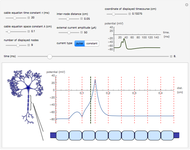 An action potential travels down the myelinated axon of a neuron. In between myelin sheath sections (indicated by light blue boxes) at the nodes of Ranvier (indicated by vertical red lines in the plot), the potential is modeled by Hodgkin–Huxley dynamics. 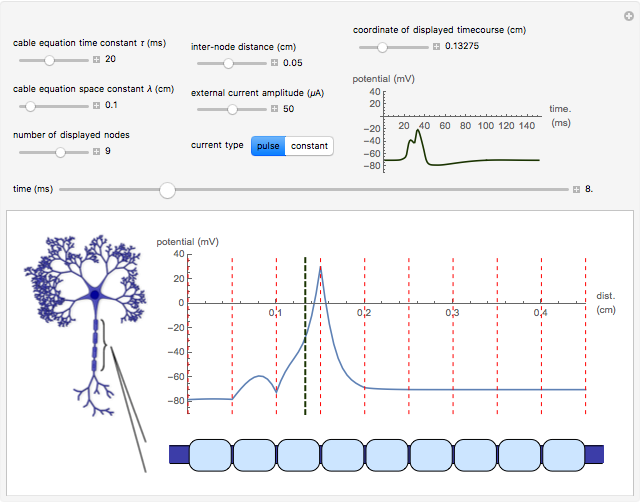 The propagation of the signal along the myelinated sections is described by the linear cable equation, whose space and time constants are variable, as well as by the inter-node distance. The signal is initiated at the left-end node by an external current pulse or constant step of adjustable magnitude. 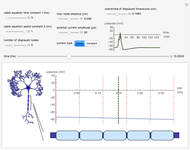 The time course of a single point along the axon is displayed in the top right. You can see the speed of signal propagation in real time using the autoplay feature of the time slider. 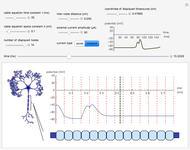 The speed of signal propagation is of critical importance for information processing in the nervous system. Since the axons of neurons can extend to over one meter in length, biological mechanisms have evolved that increase the propagation velocity of the action potential. The axons of typical neurons are ensheathed in layers of a dielectric material called myelin. The width of the sheath is approximately 30–40% of the total diameter of the axon, and is interrupted periodically by nodes, termed the nodes of Ranvier. The layers of myelin both decrease the capacitance of the membrane and increase its resistance, leading to an increase in the speed of signal propagation and a reduction of radial current leakage . 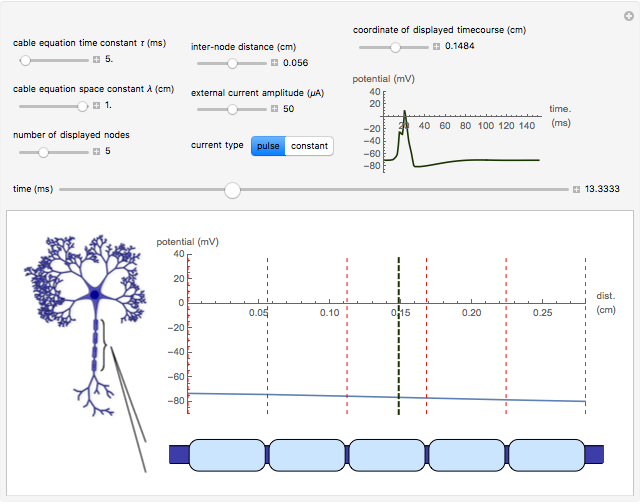 The present Demonstration follows a classical model of the membrane potential in myelinated axons proposed by Fitzhugh in 1962 .
where the parameters are the specific intracellular resistivity , specific membrane resistance , specific membrane capacitance , and fiber diameter . An external current is applied at the cell body end of the axon  as either a pulse or a constant step of adjustable magnitude. The boundary conditions between the node and inter-node dynamics are given explicitly in . You can directly control the space and time constants, which in turn represent changes in the physical property of the myelin sheath. Additionally, you can vary the length of the myelin segments and the strength of the stimulating currents. Using the autoplay feature, you can observe the speed of signal propagation in real time. 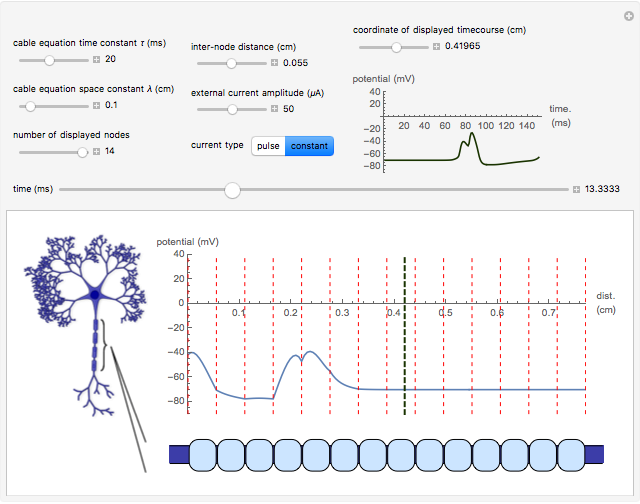 Anatomically it has been observed that the inter-node distance and thus the velocity of the signal is proportional to the diameter of the axon . Therefore, the speed may be increased by increasing the space constant or decreasing the time constant given above. C. Koch, Biophysics of Computation: Information Processing in Single Neurons, New York: Oxford University Press, 1999. R. Fitzhugh, "Computation of Impulse Initiation and Saltatory Conduction in a Myelinated Nerve Fiber," Biophysical Journal, 2(1), 1962 pp. 11–21. A. L. Hodgkin and A. F. Huxley, "A Quantitative Description of Membrane Current and Its Application to Conduction and Excitation in Nerve," The Journal of Physiology, 117(4), 1952 pp. 500–544. Oliver K. Ernst "Action Potential Propagation along Myelinated Axons"